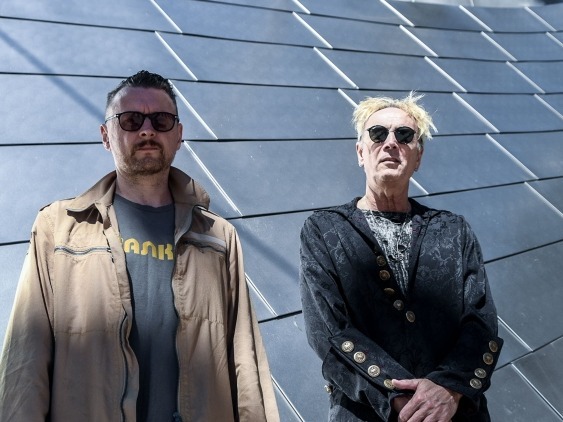 EXCLUSIVE PREMIERE: Front Line Assembly - "Rock Me Amadeus"
It isn't that often that you get introduced to the creators of storied genres. Front Line Assembly are the fathers of industrial electronic music developed in the late ‘80's and early ‘90's. Their music has been hugely influential on the commercial development of Nine Inch Nails. Like all artists who stand the test of time, they continue to evolve and tour the world playing to devoted audiences. Today we are pleased to have the exclusive premiere of Front Line Assembly's re-work of the storied "Rock Me Amadeus" originally by Falco. Hanz "Falco" Hölzel was an artist ahead of his time. His bold, international, synth-drenched style of electrofunk anticipated the sound of contemporary pop. Of course, he was hardly unappreciated in the ‘80s: "Vienna Calling", "Der Kommissar", "Jeanny", and especially "Rock Me Amadeus" all became massive hits, influencing mainstream and experimental musicians alike. The members of the Vancouver, BC industrial and electronic band Front Line Assembly were listening, and a little more than three decades after "Amadeus" topped the charts worldwide, they're breathing new life into a song that has never exactly faded away. The Front Line Assembly version of "Rock Me Amadeus" is just one of twelve scalding new tracks on Wake Up The Coma, the band's nineteenth(!) studio album. They've brought some friends to this party, too: Nick Holmes of the Swedish death metal band Bloodbath contributes his distinctive vocals to the title track, Robert Görl of D.A.F. sings on the kickoff song, and Chris Connelly, who has worked with Ministry, adds his voice to the closer. In the role of Falco, Front Line Assembly has cast Jimmy Urine of the New York City electropunk band Mindless Self Indulgence. Is he as enthusiastic about "Rock Me Amadeus" as the members of Front Line Assembly are? Is there any doubt? Maybe it's the relentlessly oscillating bass line, maybe it's the cheeky overtures to a long-dead master, maybe it's the half-rapped, half-sneered verses in German, and maybe it's just that Teutonic cool. Whatever it is, there's no electronic musician – or fan of electronic music – who can resist "Amadeus". To bring their version of Falco's hit to video, Front Line Assembly has enlisted the help of a director with roots deep in industrial and electronic music. Jason Alacrity has shot clips for Combichrist, Astrid, Skinny Puppy, and Stripped Polaris, and he's made his own ferocious, futuristic electro-rock with his own group The Alacrity. His video for "Amadeus" nods, cheekily, to the ‘80s: Jimmy Urine, in red-rimmed shades and a skinny pink tie, appears, Max Headroom-style, on an old Sony CRT television. There's laser lights, old-school threads, and some vintage video effects, too – and a rotating bust of Mozart under Miami Vice lighting. Yet the clip feels oddly contemporary – brighter and crisper than anything from the ‘80s ever looked. It's the ideal accompaniment for a reanimation of a classic pop number that always gets listeners singing along. Turn it up – The bass line will rock your windows and disturb the neighbors.